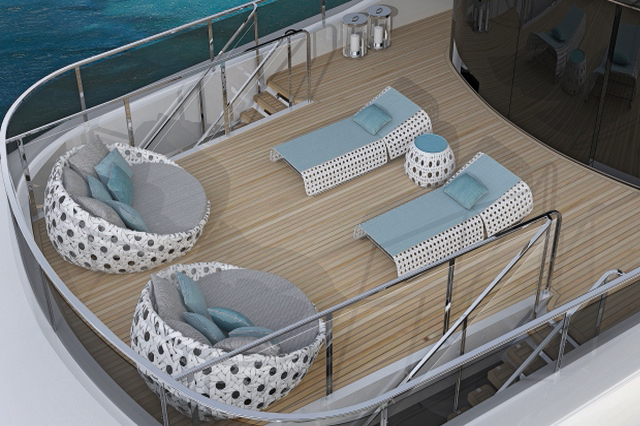 50 years of experience in the shipbuilding and refit sector, alongside partnerships with international designers who are set to reinterpret the stylistic elements unique to the ISA brand. Moving from discussion of the strategic plan to the shipyard’s tangible project planning, ISA will pick up further speed as it heads in its new direction with a completely redesigned range of models, starting with a restyling of three lines that are among the Italian shipyard’s most successful products in recent times: ISA Sport, ISA Classic and ISA GranTurismo. 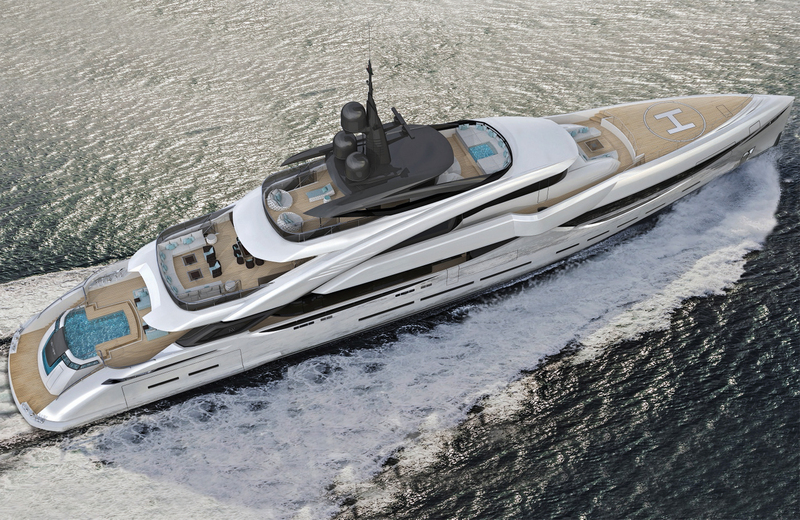 ISA Yachts has carefully restyled these three lines in association with Enrico Gobbi – Team for Design, a process which involved two models in the ISA Sport Line, with lengths of 120 feet and 140 feet, and four models in the ISA Classic Line, with lengths of 41 metres, 50 metres, 57 metres and 65 metres. 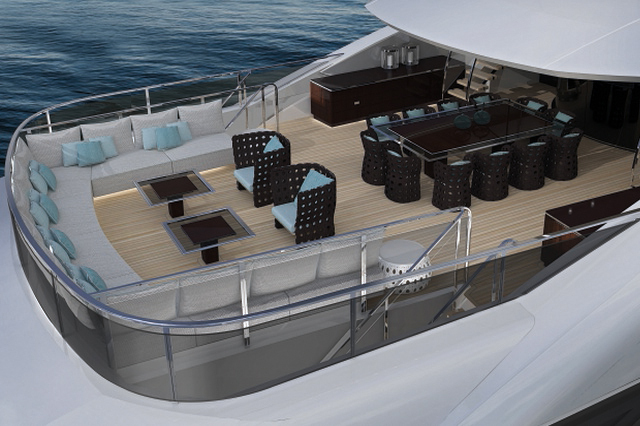 For the ISA GranTurismo Line, four models were also restyled – the 43 metre, the 50 metre, the 57 metre and the 67 metre. 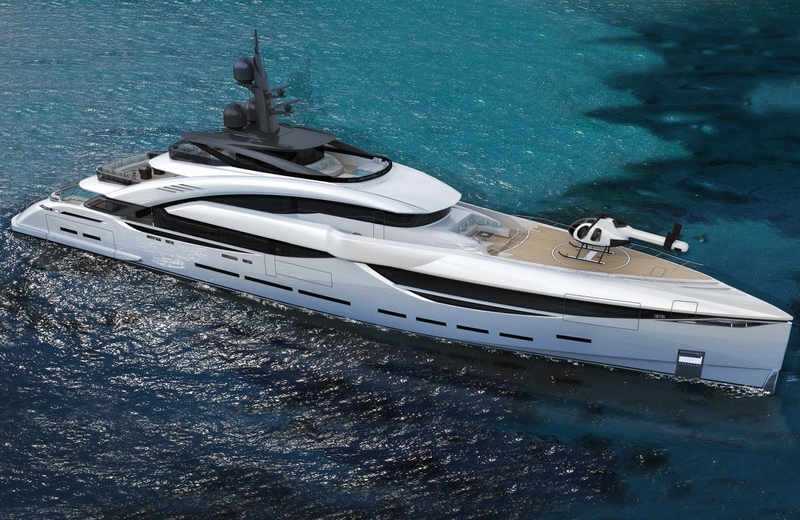 The length of the last of these undoubtedly makes it the current flagship of the ISA Yachts range, but in addition and perhaps most importantly, when it takes to the water in 2019 it will also be the largest yacht built to date by ISA Yachts. 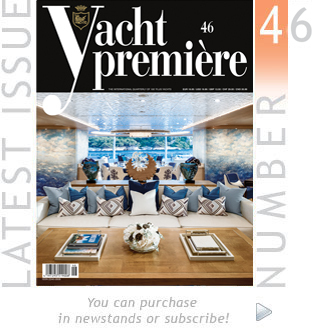 In terms of its individual pedigree, this new ISA 67 M GranTurismo model is a direct descendent of the previous model, the ISA 66 M GranTurismo, which, like the iconic first hull in the line, Okto, was a World Yacht Trophies winner some three years earlier. The family’s new arrival will certainly be a worthy heir, and one which, in this inexorable progression through the generations, starts life with one more metre in length than its predecessor. In terms of the evolution of the species, however, although it obviously keeps ISA’s DNA intact, this model takes on new aesthetic characteristics and innovative stylistic values. The exterior design of the new ISA 67 M GranTurismo emphasises the unmistakable, unique stylistic features of the ISA Yachts brand in a completely new guise, accompanied by stylistic elements with a strong sporty impact and pronounced dynamism, flawlessly incorporating details overtly inspired by the world of automotive design. 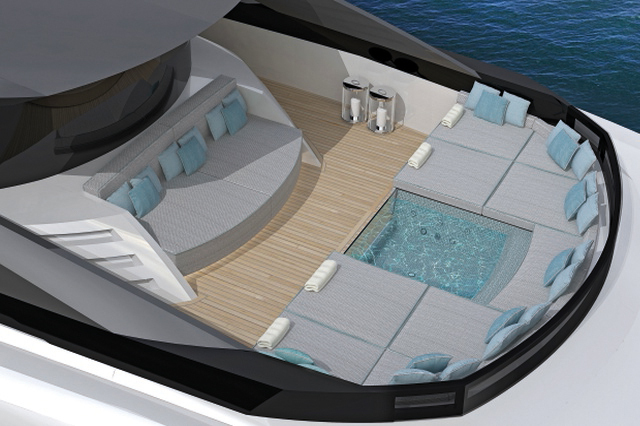 In addition to the long, large bonnet, or rather fore deck in this case, complete with a helipad, another element featuring in the design for the new ISA 67 M GranTurismo that successfully catches the eye at first glance is certainly the spacious aft deck, with its spectacular arrangement of windows and built-in swimming pool which is highly unusual in terms of both size and depth. 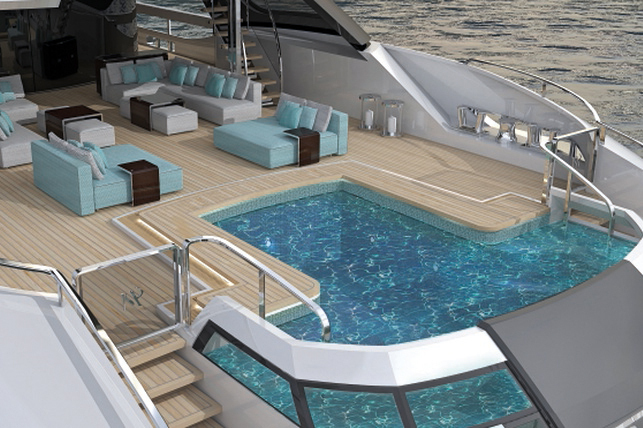 Another pool, this time with hydromassage function, is placed on the sun deck forward along with a sunbathing area laid out with sun pads, positioned opposite the sunbathing area with sun beds on the sun deck aft. In the centre of the sun deck, meanwhile, there is a ‘glass house’ with a 360-degree panoramic view, intended in the basic design proposal for use as a gym, but as it is a very versatile multi-functional space, it can be fully adapted based on the owner’s individual requirements. 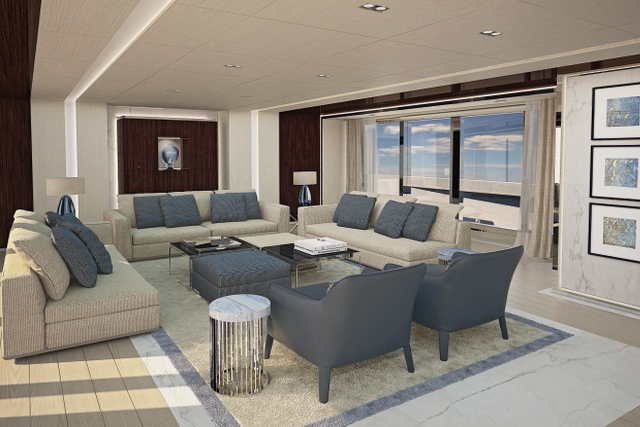 As with all ISA vessels, and all the more so in this case, the ISA 67 M GranTurismo offers the possibility of different layout solutions that can be fully customised to meet any client needs, and of course it is also possible to develop different solutions for the furnishings and decor to fulfil all the owner’s wishes. 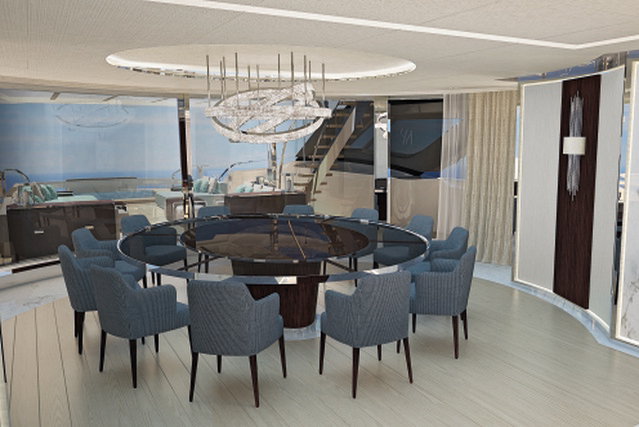 In developing proposals and solutions specially for the interiors of this new ISA yacht, the designers devised exclusive, contemporary interiors of the utmost elegance to create a welcoming, relaxing atmosphere. This is visible for example in the initial design proposal, which shows a balanced juxtaposition of materials with dark and light shades to generate a pleasing contrast, further emphasised by a harmonious combination of serene colours with vibrant accents. The furnishings alternate throughout between selected woods with a gloss or matte finish, such as dark wenge and light maple, with the addition of exquisite marble and stone varieties and refined furniture with metal detailing, such as satin-finished steel and brushed aluminium, together with a sophisticated selection of natural fabrics and worked leather. 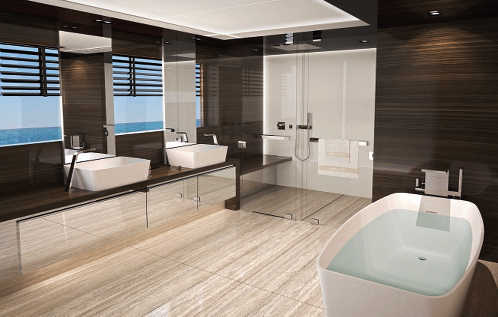 But no matter which design solution is chosen, the skilful use of direct natural light from the full-height windows and the expertly devised, cutting-edge indirect lighting system will combine to enhance the beauty of the fittings to the fullest, creating spectacular effects for the interiors. 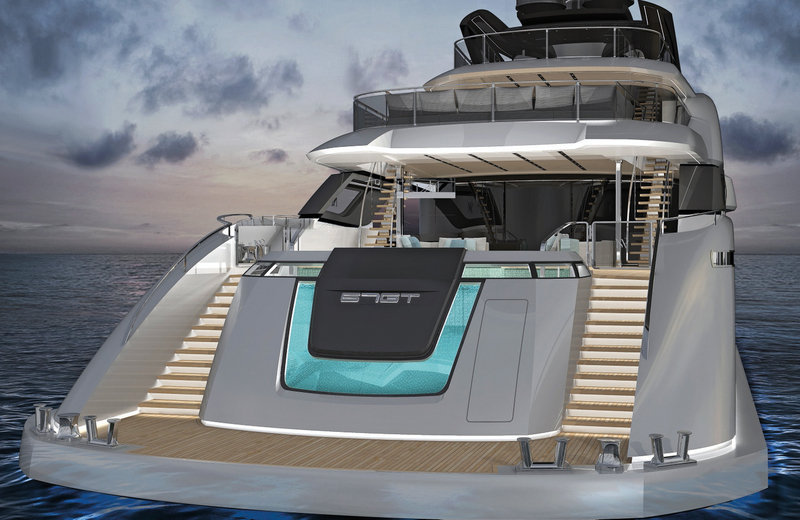 Similar to the design for the interior lighting, the exterior lighting of the new ISA 67 M GranTurismo will also boast an advanced continuous LED lighting system specially developed to emphasise the lines of the yacht to striking effect, making it recognisable even in the dark. SSC Yacht Mono G6 ✠ L.M.C.